Tomorrow is Passover and Jerusalem has been in a frenzy. Shopping. Cleaning. Cooking. But mostly cleaning. Passover focuses on the passage from slavery to freedom, and rebirth it seems requires a deep clean. Women scrub, scour, polish, boil, wash, dry, fold, clean out their cupboards, swap all their pots and dishes, cutlery and cups, and search for the last errant crumbs of bread from the previous year. This leads some women here to fume that Passover only ended slavery for men! Jerusalem’s famous Mahne Yehuda Market is packed, and queues around the fishmongers are 3 deep. That’s because the Passover table always features gefilte fish in the home of European Jews known as Ashkenazis. Jerusalem's Mahne Yehuda markets also sells fish. Gefilte means mashed up and gefilte fish are fish cakes poached in fish stock. Warning: they are something of an acquired taste. I say that as someone who is a fan of almost every type of fish cake – Thai fried fish cakes, Boston crab cakes even fish balls made from tinned tuna. If you've never had gefilte fish, don’t expect to fall in love first try. But if you know them and like them – and they do grow on you – this is a wonderful recipe. 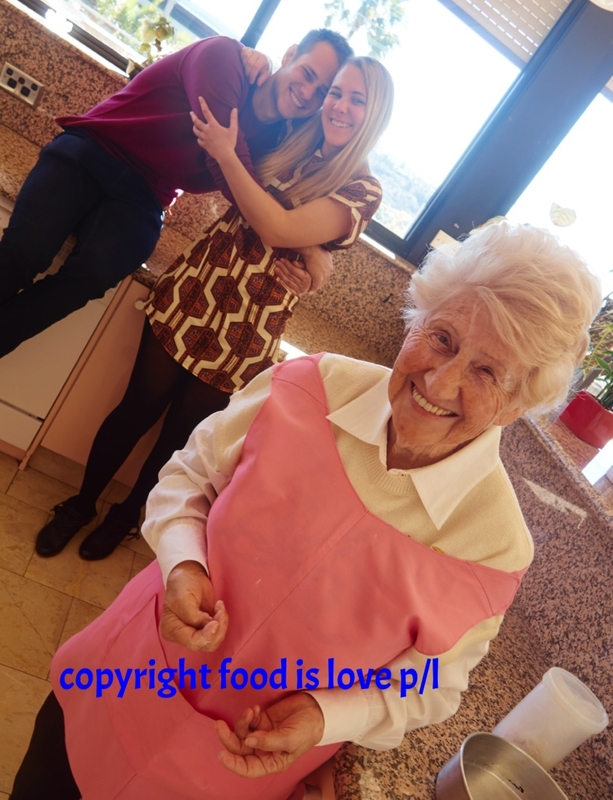 It’s the recipe of Jerusalem grandmother Rina Mevorach, who turned 90 this week - the second Food is Love grandmother to hit her ninth decade this month! And why would turning 90 slow you down? Rina's still preparing the gefilte fish for this year's large Seder meal at the home of her son and daughter-in-law. In Sydney, Berthe Bart also celebrated her 90th birthday. Full disclosure: She is my best friend's mother-in-law, and I have known her almost all my life, and her amazing story will be told here soon. Best wishes to both wonderful women! It seems there is another woman celebrating her 90th birthday this week, over in England -- you might have heard about it, since it's the Queen. Congratulations to her too. But can she make gefilte fish? 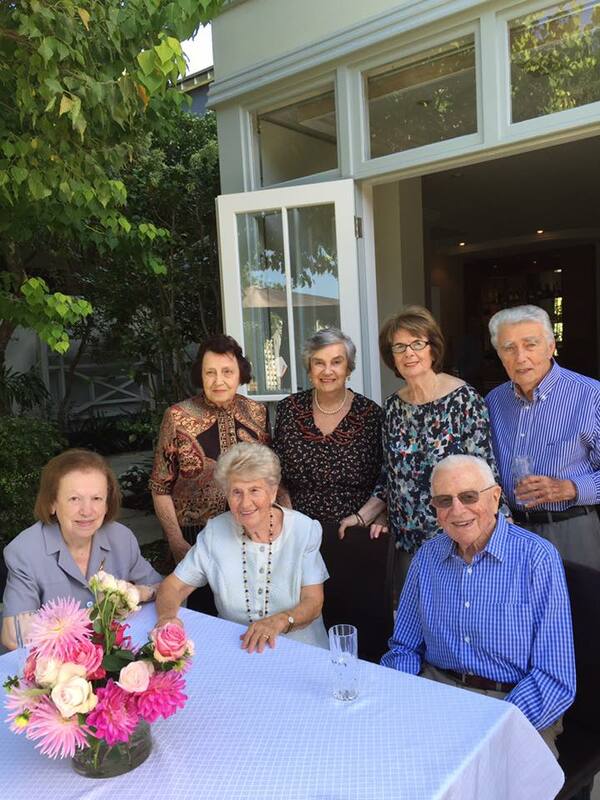 Below, Berthe Bart with guests at her 90th birthday afternoon tea in Sydney, and with two of her grandchildren, James and Nikki Bart. The long lives of this generation, despite their suffering and trauma, continue to amaze me. 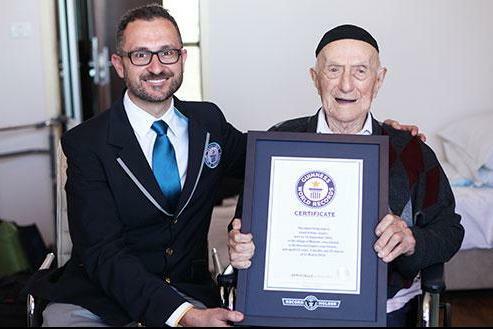 Who can credit that the oldest man in the world at the moment is 112 yo Haifa resident Yisrael Kristal, who is an Auschwitz Survivor? 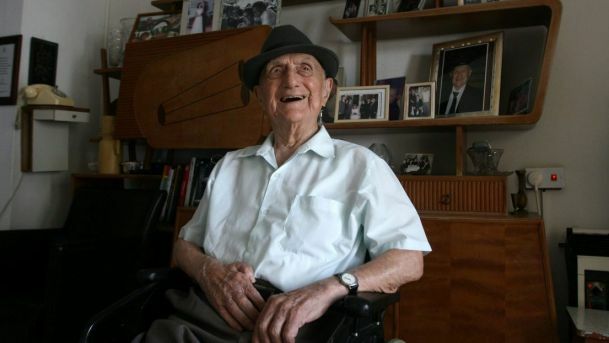 His wife and children died during the War and when he was liberated from the concentration camp, the Polish sweet maker weighed only 37 kilos – and yet he is still here to tell his story. When asked the secret of a long life, he gave this lovely answer. “I don’t know the secret. I believe that everything is determined from above and we shall never know the reasons why. There have been smarter, stronger and better looking men than me who are no longer alive. All that is left for us to do is to keep on working as hard as we can and rebuild what is lost." Rina Mevorach is one of the orginal Food is Love grandmothers, and you can read about her amazing life here – it’s the little known story of the Jews of North Africa, and their experience when Nazi Germany invaded during WWII and tried to impose the Final Solution there too. Over the past year, we have featured many of Rina's recipes, including mafroum, sambousek, and best almond biscuits. Hang on a moment – gefilte fish is an Ashkenazi ie European Jewish speciality, so how come we are learning how to make it from a Sephardi grandmother from Libya? Rina didn't eat gefilte fish at home in Libya, it was unknown there. She learnt it in Israel, when she arrived after World War Two. She followed her heart here. During the War she married a British soldier who turned out to be a Jew from Jerusalem, and she has lived here since 1946. In fact, most of her life here she lived just above the Jerusalem Market. “My sister married an Ashkenazi man. Mostly she cooked our food for him, because our food is very delicious. But Ashkenazim love gefilte fish, so she made it for him, and I watched her. And now I make it better than she did!” says Rina happily. Carp is the traditional fish used in this dish, but any river fish will do. It’s also an economical recipe – you use every part of the fish! Rina buys a whole fish, and gets the fishmonger to give her 2 bags. One with the meat for the fish balls and the other with the off-cuts for the stock. Rina still makes gefilte fish for all family gatherings, and on the day I come by, she's showing her daughter-in-law Michele how to prepare it. Michele likes Rina's version - maybe even more than Rina does! Rina has a skill for cooking food she doesn't like and won't eat. Rina confesses that she has never liked the standard Jerusalem method for preparing the fish cakes, starting with the fish being sold alive at the Market. This picture of Passover carp by Rina's husband Moise Mevorach hangs in her kitchen. Mix and shape into balls. The size and shape depends on the location in Eastern Europe. Russian Jews like larger oval shaped fish patties that are barely sweet. Many also brown a little sugar first to give them colour. That’s anathema to Polish Jews, who like their gefilte fish round, pale and sweet. So I think your family and history determine your preference. In the pot in which you fried the onions, boil the soup ingredients in 2 litres of water. Cook 45-60 minutes. Remove carrots to use for decorating the fish balls. You can make the stock first, or ahead of time – it tastes better the longer it sits. 1. Once you have shaped the fish balls into the size you prefer, drop them into boiling stock. As soon as the water stops boiling, stop adding the fish balls. Only once it returns to the boil, keep adding more. It will take you 3-4 go's to do the lot. 2. Cook for 1 hour. Remove and cool. Slice cooled carrots into rounds and put one on top of each patty. Rita also has a delicious recipe for a Sephardi alternative, a fish coucous which is increasingly appearing on Israeli Seder tables -- but might include it later in the Holiday. Gotta get this one out asap for those who might need it!